Austan D. Goolsbee studies the Internet, the new economy, government policy, and taxes. Goolsbee explains, "I am a data hound and so I usually end up working on whatever things I can find good data on. The rise of Internet commerce completely altered the amount of information you could gather on company behavior so I naturally drifted toward it." His research has earned him much professional recognition. In 2003, he was given a grant from the National Science Foundation. 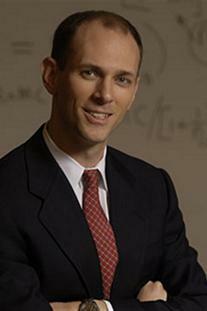 Goolsbee was named a 2006-2007 Fulbright Scholar. He will research Internet taxation in the U.S. and European Union while spending part of the upcoming academic year at the London School of Economics and the Institute for Fiscal Studies, also in London. He has been named one of the 100 Global Leaders for Tomorrow by the World Economic Forum, a Switzerland-based group that builds parnterships between business and society. Crain's Chicago Business has named him one of it's "40 under 40" to watch. He was described by fellow University of Chicago economist and PhD classmate Steve Levitt as someone who "asks questions people care about." His ability to popularize economics has made Goolsbee popular in the media. Besides his New York Times column, he appears frequently on radio, the Web and television. Topics he has commented on include: education and the success rate of terrorists, TiVo's affect on advertising, the real estate bubble, and brokers incomes. Goolsbee serves as a member of the U.S. Census-Advisory Committee, a research associate for the National Bureau of Economic Research, a research fellow for the American Bar Foundation, a columnist for the New York Times and an economic advisor to Barack Obama. He has twice been named as a "star" professor by BusinessWeek's biannual "Guide to the Best Business Schools." Goolsbee thinks his research on telecom, media and technology makes his "class on the subject pretty different from what you can find anywhere else." His goal for students taking his classes is for them to leave with the ability to analyze companies, industries, and policies in a new way. He says "that after a lot of years of doing this, they have yet to disappoint me." Goolsbee spent a year as a special consultant for Internet Policy for the Antitrust Division of the Department of Justice and five years as a Faculty Research Fellow for the National Bureau of Economic Research. He also was the lead editor for the Journal of Law and Economics for several years. He earned a bachelor's and master's degrees in economics from Yale University in 1991. Four years later, he graduated with a PhD in economics from Massachusetts Institute of Technology. He joined Chicago Booth in 1995. Insanely committed to his work, Goolsbee was spotted in the classroom on his wedding day, tuxedo and all. He enjoys improv comedy and participating in triathlons.